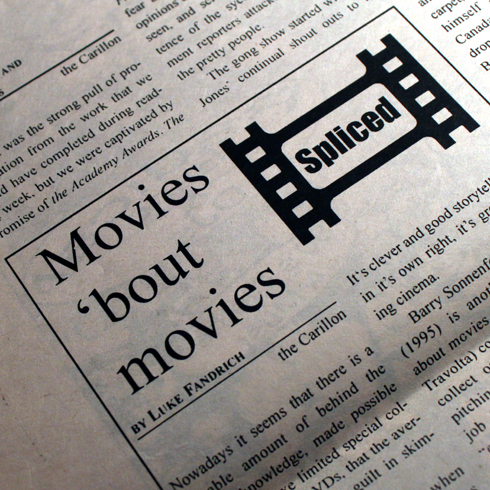 The following comes from my column, Spliced from Volume 47 - Issue 19 of the Carillon (the University of Regina newspaper) from March 2005. Nowadays it seems that there is a sizable amount of behind the scenes knowledge, made possible through deluxe limited special collector's edition DVDs, that the average person feels no guilt in skimming over. You have to question when watching some of these features (the lengthy Lord of the Rings box sets come to mind). Why would we want to know about the make-up artist who worked on extra number 11 on whatever deleted scene? Honestly, I’m all for special features, and I did enjoy the Lord of the Rings, but so many DVD bundles seem to have ignored the “quality before quantity” rule. Special features are popular for obvious reasons; We enjoy seeing more of a film that we love. It seems sometimes that features are essential to understanding a film, and sometimes they’re purely promotional to convince people that the DVD is actually worth that new release $30 price tag. I think we all roll our eyes though, when we click on a production featurette that is simply a mash up of the film’s trailer and the lead actors spewing about how this is a film you have to see. Perhaps it would hold some significance, had we not just watched the movie. I find the best of both worlds in movies about movies, and filmmaking. For instance, I love the opening of Who Framed Roger Rabbit (1988) and how Robert Zemeckis melds animation and live action as though filming a cartoon is just a matter of getting all of your characters to show up at the same time. It’s clever and good storytelling, but in its own right, it’s groundbreaking cinema. Barry Sonnenfeld’s Get Shorty (1995) is another great movie about movies. Chili Palmer (John Travolta) comes to Los Angeles to collect on a debt, and ends up pitching a movie idea about the job he’s doing. Playing on the “everyone wants to be in the movies” bit, Get Shorty is great fun that anyone accustomed to following the entertainment industry will latch onto. Other great movies about movies to check out include L.A. Confidential (1997), Ed Wood (1994), and Woody Allen's Hollywood Ending (2002). And Starring Pancho Villa as Himself (2003) directed by Bruce Beresford, is a story about how filmmaker’s were hired to film Pancho Villa and the Mexican revolution. What’s astounding about this film is its historical context, and how the hired filmmakers created a legend out of such an infamous character. It's an entertaining movie made even better by the history of what they were doing. Pancho Villa even agreed to a clause in his contract for the film that stated he could only fight during the day so that there was ample light for filming. Learning about film can be a lot more fun, and even more educational when it’s dramatized (at least they have to hit plot points). Who is kidding who anyway? Most of the special features are orchestrated pretty well on DVDs to make the experience of making the movie come across as awe-inspiring and life-changing. I’ve yet to see a director or actor completely broken and confessing to the camera that it was all a mistake, but my fingers are crossed. Use a few of these recommendations as a sampler to get into movies that go behind the scenes. You obviously have some features to catch up on, so pop in a movie, and like me, use it as an excuse to study.